On Dr. Carol Francis Radio Talk Show, Psychologist Dr. Carol Francis interviews 15 professional authors who offer practical and inspirational tools to increase personal wealth, improve health, create business opportunities and develop personality traits of success, as well as manage sales or marketing approaches that are meaningful. Program live on July 9 at 10:00AM PCT or on-demand at http://www.blogtalkradio.com/dr-carol-francis/2012/07/09/power-tools-to-create-health-wealth-meaningfulness-succes. Imagine 15 experts providing tools to enhance health, wealth, personal growth, sales, and happiness in a two hour on-demand program and you have this Dr. Carol Francis Radio Talk Show. On Dr. Carol Francis Radio Talk Show, Psychologist Dr. Carol Francis interviews 15 bestselling authors who offer practical and inspirational tools to increase personal wealth, improve health, create business opportunities and develop personality traits of success, as well as manage sales or marketing approaches that are meaningful. 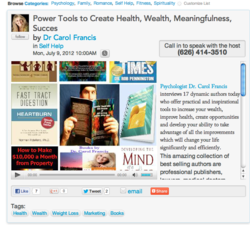 Program live on July 9 at 10:00AM PCT or on-demand at http://www.blogtalkradio.com/dr-carol-francis/2012/07/09/power-tools-to-create-health-wealth-meaningfulness-succes. Dr. Carol Francis, author of 7 books and radio talk show host, interviews 15 successful individuals who have authored their formulas for success in her 2 hour radio talk show as an Author Show Case aimed to help people live effective lives in business, in health, and in relationships. The line-up of authors includes the following. Patrick O'Donnell (revstreammarketing.com) in his book "Revolutionize Business & Life"
reveals how to create lasting changes in Business and Life in just 7 doable steps. How do you generate more leads and sales while on autopilot than when using a team of telemarketers? Marilyn Gordon (lifetransformationsecrets.com) brings life by bringing enlightenment, adventure and imagination in her bestseller "Realize Your Greatness: A Spectacular Journey to Success, Transformation, & Spiritual Power." Health Professional Edie Summers (EdieSummers.com) inspires natural health and healing in her moving account of recovering from Chronic Fatigue in "The Memory of Health." Tools of health and pain relief lace each page and Edie Summers successfully practices what she teaches. Yolanda Baker (graystarinvestments.com) details successful tools for dealing with extreme family medical expenses in "BITE Your Bills: Cut Your Medical Expenses." Kimberly Willis, PhD (kimberlywillis.co.uk) is a UK therapist and weight loss specialist. Dr. Willis offers body-reshaping tools to be implemented with ease and hope in "The Little Book of Diet Help." Losing weight and increasing happiness can be accomplished through Dr. Willis' food science and new emotional techniques. Best Selling author Jonathan Chase (thehypnotist.co.uk/), top hypnotist from the UK, suggests all persons learn "How to Make Friends with Yourself and Influence People." Jonathan Chase offers a free personality analysis which helps people focus on their natural strengths as well. Dr. Robert Pennington (DrRobPennington.com) is a Psychologist, TV Host of “Stress and Change,” and co-founder of Resource International and MindOH. Dr. Pennington recounts events that many can resonate during these tough financial times. Dr. Pennington lived through many traumatic live events and demonstrates how to resurrect out of such travesties in his book "Find the Upside of the Down Times: How To Turn Your Worst Experiences Into Your Best Opportunities." Dr. Mitchell Kershner a Naturopathic Doctor and gourmet cook reveals from his upcoming book "10 Seconds That Could Change Any Situation." Dr. Kershner helps all to understand how to change the body's physiology to increase effective and healthy energy. Marc Carlin (hypnoticstate.com) co-authored "Sheila Granger's Virtual Gastric Band Workbook, The Solution To The Worldwide Obesity Epidemic" which reveals the power of the mind to replicate a serious surgery used for weight loss. Dr. Norm Robillard provides effective tools which create relief from the serious pains of many gastric complications, including acid reflux, in "Fast Tract Digestion Heartburn." Norm Robillard, Ph.D. is a research microbiologist who spent 20 years in the biotechnology industry before founding the Digestive Health Institute. Dr. Swan Nicole Montague (universityofspiritmedicine(at)gmail(dot)com) from the UK challenges traditional historical views in her book, "The Book of Sahra, Jesus' Secret Wife.” How her discoveries impact long held beliefs and open the door to other perspectives will be shared during this radio segment. Fitness expert Fredrick Hahn, (fhahn(at)seriousstrength(dot)com) along with co-authors Drs. Mike and Mary Dan Eades (authors of Protein Power) makes total fitness and max fat loss safe and extremely efficient in "The Slow Burn Fitness Revolution: The Slow Motion Exercise That Will Change Your Body in 30 Minutes a Week." This method works! Wendy Lamont's discusses the core tools from her many publications which include “Bodytone Health Program,” “The Anti-Aging Diet: How to Lose 3-6 Kilos and Look 5 Years Younger in 4 weeks,” “How to Make $10,000 a Month from Property,” “How to Make Millions out of Property in Your Spare Time,” “Tax Liens & Deeds Homestudy Course,” and "MY UNITY", a documentary to be released soon. Lori St. John, a lawyer on the east coast of the US, promotes an attitude of fortitude and endurance in her inspirational book "Live Your Life and Never Give Up: Only Then Will You Achieve Your Purpose and Destiny."